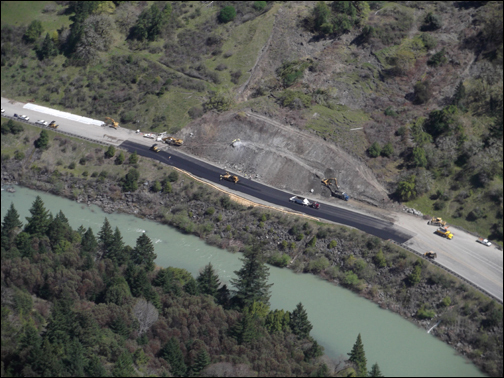 Highway 101 paved. Photo Lindsay Locke. As this photo taken by Lindsay Locke of Lost Coast Aviators shows, Caltrans and Shea Construction have removed tons of soil and trees to ready the road for tomorrow’s 6am opening. Note the belly dumping truck dumping asphalt in rows, followed by paver with a pickup machine that lays the asphalt, while,at the far left of the dark strip, a roller compacts the final product into a smooth surface for driving on. Soil has been removed to several spots including near Phillipsville. Drivers have been hauling through the night 24 hours per day carrying endless dump truck loads of soil from the slide. A robo call went out to locals that all school are open tomorrow with regular bus schedules in place. *Hat tip to SoHum Awareness for gathering all this information. This entry was posted in Roads and tagged 101, Lindsay Locke, photos, slide. Bookmark the permalink.